Golf bags and clubs are expensive and take up a lot of space, especially for applications like country clubs or golf courses that store many at once. The golf bag organizer racks are a great way to keep bags stored upright, which saves space and prevents damage. Organizing is also much easier with the golf bag racks. Instead of cluttered on your floor area or stored in multiple places, the golf bag organizer racks store them in one compact solution. 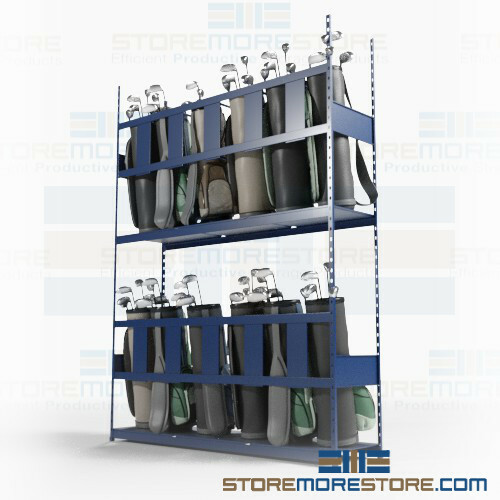 The racks are double-tiered, allowing you to store more bags in a smaller footprint by utilizing your vertical space. Dividers also keep the golf bags stored upright so they’re not leaning against each other. Each bag gets its own divider section. When someone needs to retrieve their bag, it’s easy for them to find and remove it without disturbing the other stored bags. The golf bag racks are available in multiple sizes depending on how many bags you need to store. All come with two levels of storage and widths up to 6′, which stores 12 bags. See the features below for more information on widths and sizes. 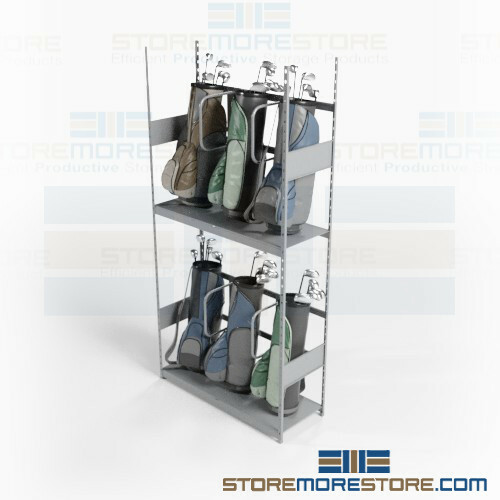 Golf bag organizer racks are available to buy online with optional shelving volume discounts. For further assistance, call us at 1-855-786-7667 or send us a message to speak to one of our experts.